Never thought of visiting Vietnam? Well, you might be soon. In our Breakout Role Role series, we take a look at places that have seen huge increases in tourism in the last few years, and try to figure out what’s causing all the hype. Many tourists come to Vietnam for the same few things. For most first-time visitors, the beauty, history and cultural attractions of Ho Chi Minh City and Hanoi, the country’s two major metropolitan centers, are enough to make for a seemingly comprehensive vacation. 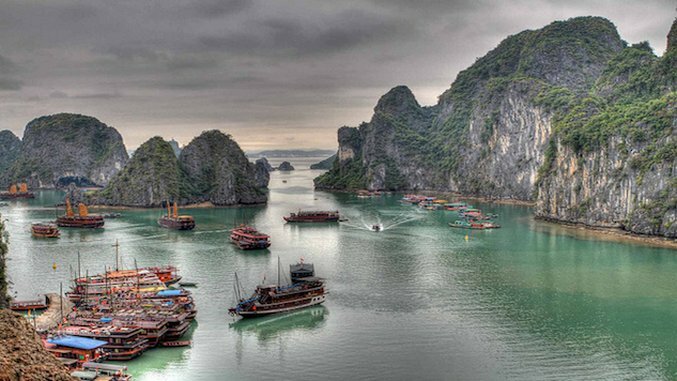 And while those destinations are enticing, that’s simply not all there is to do in Vietnam. Ngai, who has lived in the region for years, says her company has noticed that many tourists come back to Vietnam for a second or third time after their initial visit, making plans to see the more rugged and natural parts of the country. As more people have planned their return to the Southeast Asian nation, tourism has exploded with the number of yearly visitors in Vietnam increasing from 3.7 million in 2009 to nearly 8 million by 2014. Much of Vietnam’s tourism boom was a matter of good timing. After declining in the wake of the 2008 Financial Crisis, the country’s economy began to bounce back in a big way. Simultaneously, the economies of nearby nations, such as South Korea, were growing too, giving regional tourists more money to spend on traveling abroad. ”[When the economy grows], you have a lot of people looking for places to take a golf vacation, or a resort vacation, and Vietnam has a lot to offer on that front,” Ngai says. And Vietnam was ready for these changes too. The growing economy meant new roads, buildings and shopping malls were being constructed nationwide. Ngai even remembers the large number that opened around this time, giving the country the tools it needed to receive its vastly increasing number of foreign guests. “It really just all kind of came together,” Ngai says. As the country has become more suited toward foreigners, Vietnam’s local flair has been forced to adjust in order to survive. While souvenir shops and tourist-oriented restaurants now litter city streets, Ngai says traditional Vietnamese hospitality still “seeps through” the slew of modern developments, and that authentic local flair still exists for anyone willing to put some effort into finding it. Although Ngai says tourism has widely benefitted many Vietnamese people, that’s not true for everyone, with some people often feeling as though their culture is being put on “for show,” in order to entertain travelers. When it comes to planning a trip to Vietnam, food needs to be high on the agenda. Even outside of the worldwide fame of pho and a growing interest in Vietnamese coffee, which is normally served on ice with sweetened, condensed milk added in, Vietnamese cuisine has a lot to offer visitors. President Barack Obama, who recently made an appearance on “Anthony Bourdain: Parts Unknown,” brought even more attention to Vietnam’s food scene when he and the show’s host sampled bun cha—a Hanoi-area dish consisting of fatty pork served over white noodles—during a recent episode. Edible attractions notwithstanding, Vietnam’s most notorious sight is easily the mystifying limestone islands of Ha Long Bay, which gained even more celebrity this year when it became home to the world’s largest cable car. Elsewhere in the country, tourists enjoy the kind of out-of-the-way sights Ngai mentioned as being such a highlight in Vietnam. Whether its biking through the countryside, trekking through the mountainous, rice-growing villages in the Lao Cai Province or fishing off the coast, visitors continue to find reasons to return to Vietnam. Travel Concerns: There are no major safety threats currently in Vietnam, however it should be noted that travellers need to obtain a tourist visa in order to enter the country. More Info: The Vietnam National Administration of Tourism’s website features tourism news and information about traveling to Vietnam. Dillon Thompson is a University of Georgia student and freelance writer with a love for travel and an addiction to coffee and hip-hop music.